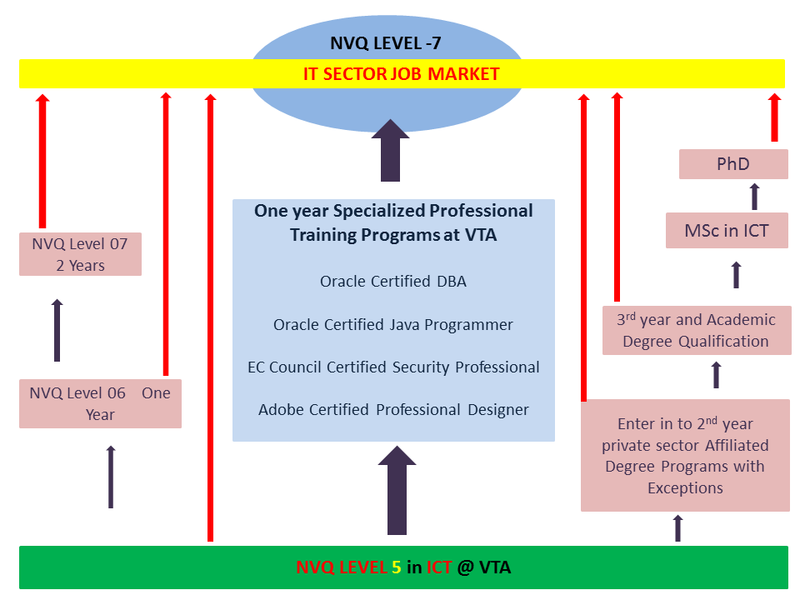 The NVQ-5 in ICT is a full time one year training programme introduced by the Tertiary and Vocational Education Commission under the initiative of the Government of Sri Lanka. This training programme will open assured opportunities for students who are seeking job opportunities in the ICT industry in Sri Lanka. The NVQ 5 in ICT is a nationally and internationally recognized qualification which provides both knowledge and skills to its followers to work without experience at the end of the training programme. After the completion of NVQ 5 in ICT Candidates Get Opportunities in to Specialized in Following Streams up to Graduate Qualification. Following are NVQ Education path.